I find both much cheaper and easier to find in Asian food markets. I was lucky to score a large package of short ribs for four dollars on the weekend. 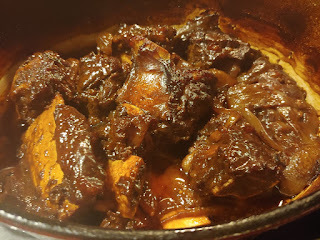 When cheap cuts of beef on the bone are braised for hours in the oven submerged in liquid the result is fall off the bone melt in your mouth meat. 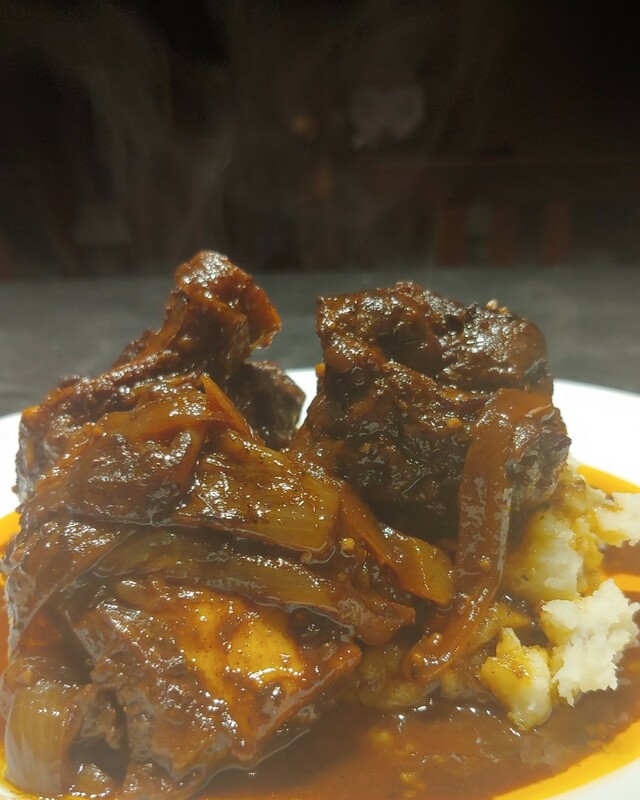 St. Patrick’s Day fare is often hearty fare like braised meats and potatoes paired with dark ales and stouts. Perfect for the blustery March weather. 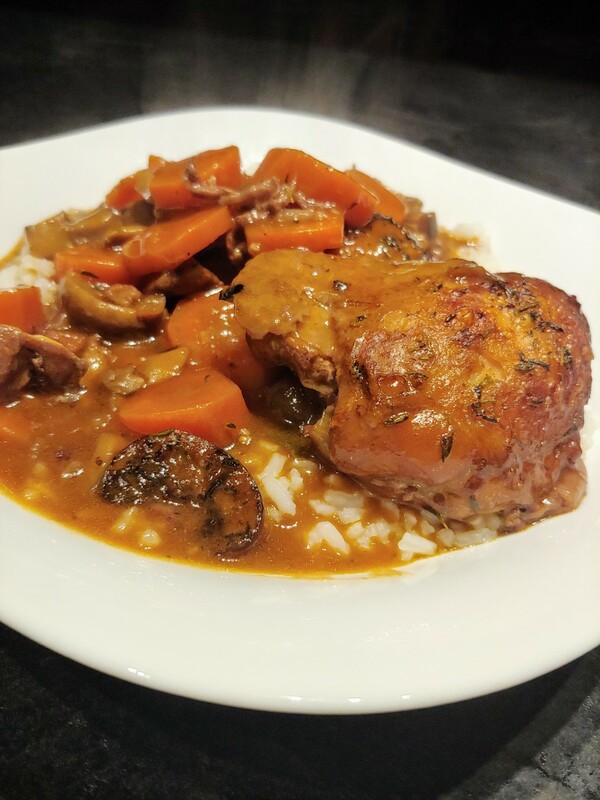 This dish is now one of my favorites and combines all the above components for a wonderful St. Patrick’s Day meal. 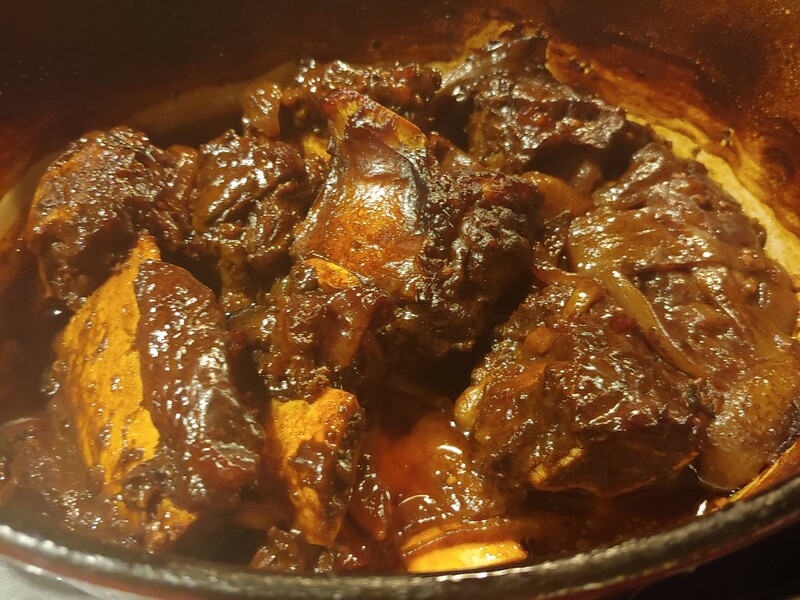 In an oven proof Dutch oven heat a few glugs of oil and brown the ribs on all sides. Remove and set aside on a plate. Add onions and garlic and cook until onions are tender. Add and combine remaining ingredients. Add ribs back in and bring to a simmer. Cover and place in the oven for 3 hours. Remove lid for last 15 minutes or so if liquid not reduced enough. Serve over mashed potatoes. Sauce over top. 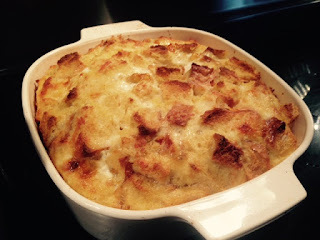 As I write this wind and snow is blowing outside my window, so this recipe has me thinking about the warm south. 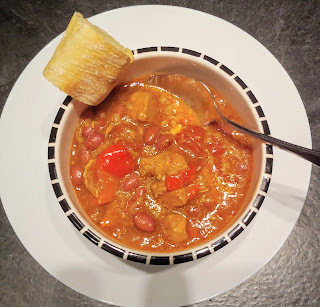 Homebound on another winter storm day this week I created this hearty southwestern style chicken stew. The hot peppers I was recently given as my inspiration. A huge jar of jalapenos, can of chipotle peppers in adobo sauce and tabaco sauce are now in my possession. My mission is to find ways to use them up. I used boneless chicken breasts in this stew as it was what I had on hand however boneless thighs can be used instead. Add the chicken and vegetables and sauté until lightly browned. Add seasonings, hot peppers, rice, beans and tomatoes and combine. Bring to a low boil and then place in oven for about 3 hours. Super Bowl Sunday is here again! 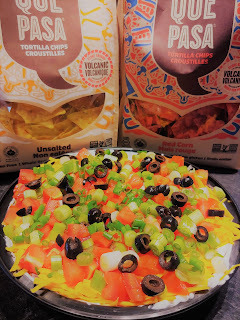 Many of us will be gathering with friends to watch the game and nosh on fun foods like pizza, nachos, wings and chili. I’m taking this Layered Mexican Dip to our gathering today. There are many versions of this dip around and ingredients can be substituted with the items I’ve listed below. It is quick to assemble but does require a few hours chilling time. Cheers and enjoy the game! · Garnishes for the top choose diced tomatoes, sliced green onions diced red onion, black olives, shredded lettuce, salsa, corn, chipotle peppers, diced green or red peppers. Puree or mash the beans and add the seasoning. Mix well. Spread on serving plate of choice. Mix the cream cheese and sour cream. Spread on top of the beans. Cover with the shredded cheese. Garnish with topping of choice. Chill in fridge for at least 2 hours. Serve with tortilla chips on the side. My preferred brand is Que Pasa. Found in the organic section if most supermarkets. I find these the best for flavor and size. They are all-natural just corn, oil and salt, nothing else! Almost to the day. 3 years since I have posted here. A lot has happened since then, new career, kids grew up and life got busy. I'm not even sure folks read blogs like this anymore do they? Anyway today I found myself home with a day off and it is cold, windy and snowing like crazy. As usual I found refuge in the kitchen making a hearty dish to warm body and soul. So I thought I would dust off this old blog and give it new life with some changes though. I will not just be posting recipes. I will post my reviews of restaurants and food related products and equipment as well. 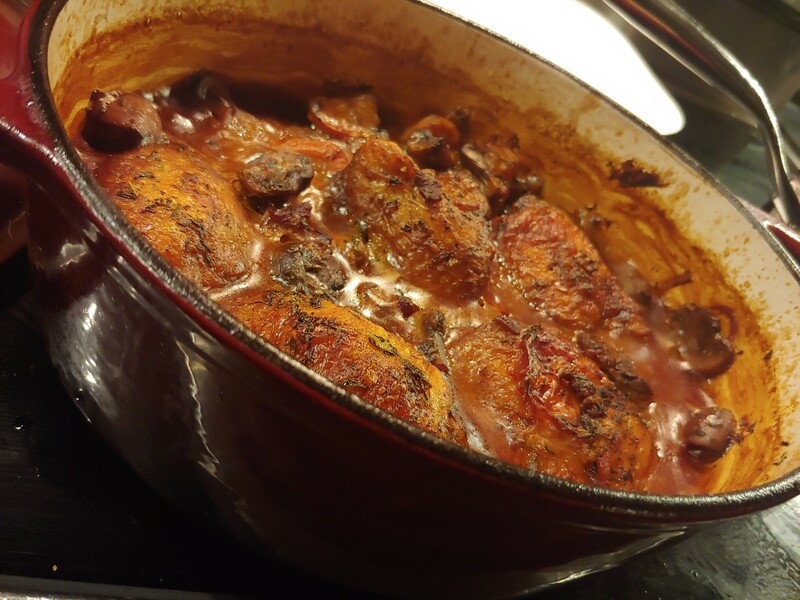 With that said I give you today a different version of a previous post of Coq au Vin from a long while back. It is good to be back! In a large cast iron or regular dutch oven heat a few glugs of oil. Add the bacon and fry until crispy, remove and reserve. Add the chicken and brown on all sides. Set aside with the bacon. Add the onion, mushrooms and carrots and saute until soft. Add the flour and tomato paste and cook for a minute stirring. Slowly add the brandy and stir to deglaze the pan. Add the wine, broth, thyme and bay leaves. Add back the chicken and bacon, bring to a low boil . Cover and place in oven. Cook for about 2 hours or until chicken is pulling away from the bones. Remove bay leaves and serve over mashed potatoes or rice. I love cosy winter mornings hanging around the kitchen drinking tea and reading the paper. It's a perfect time to have something in the oven that warms up the room. This breakfast brunch recipe I recently came across in my collection I had forgotten about. It's so easy to throw together and pairs well with bacon or sausages. You can decide what type of cheese to use depending on your preference of taste. I used extra old cheddar and Asiago here. Bake in the oven until puffy and golden. 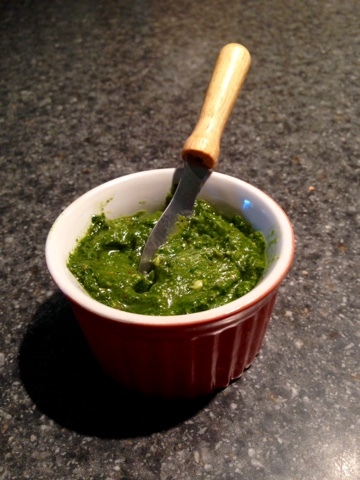 My basil plant grew like mad while we were on vacation this year so I took the opportunity to make pesto, a favorite in our house. I also add spinach to soften the favour a bit. I haven't really made specific amounts here as it depends on how much you want to make and how much basil you have. My recipie made one large and one small mason jar. 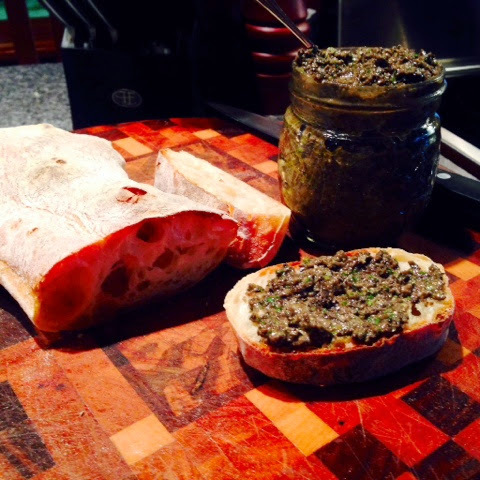 We love pesto tossed with gnocchi or pasta, but spread on warm Italian bread is the best! 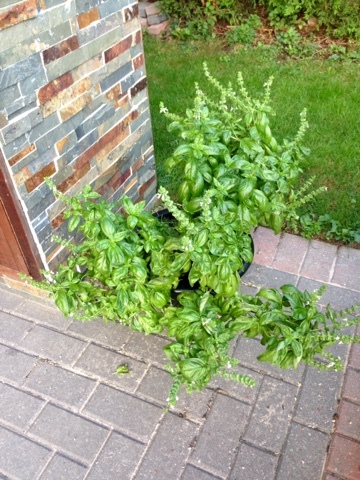 Enjoy the basil while it is at its peak for the frost will soon be here . Blend basil, spinach, walnuts and add olive oil in blender or food processor until desired consistency is reached. Add salt,pepper, and lemon juice and mix well. Place in jar and cover tightly. It seems like the minute Thanksgiving and Halloween are over we are bombarded with Christmas. I'm still trying to get through the Halloween candy and leftovers from Thanksgiving in the freezer. I just came across two cans of pumpkin pie filling that never got used this Thanksgiving so, not wanting to make pie I searched the Internet and my cookbook library for a recipe for soup. I came up with nothing as all the recipes called for pumpkin purée which is unsweetened (my cans contained sugar). I decided to wing it and make my own creation. We were all really pleased with the end result. The sweet pumpkin really paired well with the middle eastern spices. Really quick to prepare this would be perfect after a long day rushing to do get Christmas shopping done in the cold. Heat the oil in a heavy soup pot. Add onion and garlic and sautée until soft. Bring to low boil, reduce heat and simmer for about 30 minutes. Use an immersion blender to purée onion if you wish. We are on holidays this week and getting a lot done around the house. Today was rainy so we ran errands and then I found myself puttering around the kitchen afterwords. A visit to our local Italian bakery and deli inspired me to try making my own olive tapenade, something I've never done before. I am pleased with the result and plan on making different variations. By the way I installed blogger on my iPad. This is my first posting using it. It may look different..please bear with me while I get the hang if it! Combine all ingredients in food processor and pulse until blended. Serve on bread or crackers. Will keep in fridge in a jar for about two weeks. 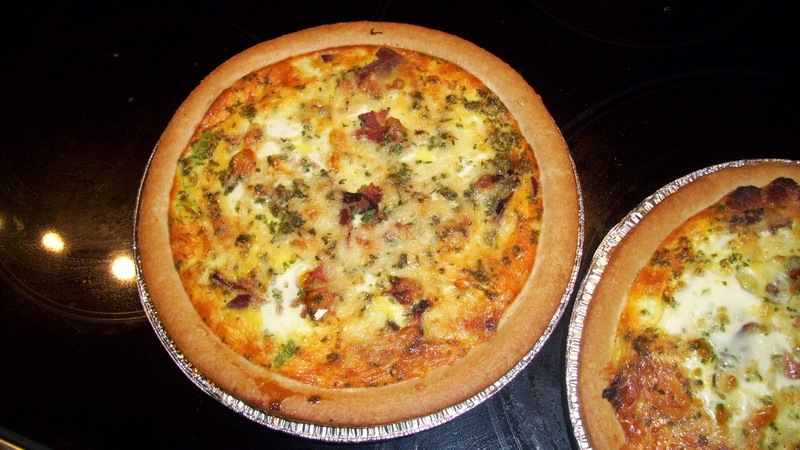 Although its been around forever..quiche had its heyday years ago back in the 80's and 90's. It was popping up in cookbooks and restaurant menus everywhere. I must admit I have forgotten about it until last weekend when I was looking for something different to make for brunch, instead of my usual frittata. I created this hearty layered version using leftover potatoes from the night before. It took no time to assemble. I know I should have made my own crust but I had a ton of yard work to get too so I cheated and used a store bought I had in the freezer. This could be served for supper as well with a salad. My husband loved it and asked for it to be served more often. 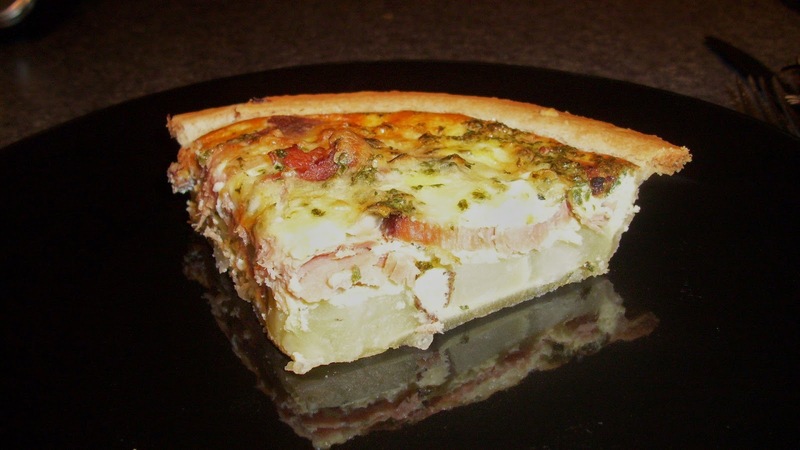 So there you go...contrary to that popular 80's book, real men do eat quiche! 5 beaten eggs for each quiche with cream and parsley mixed in. Layer ingredients in pie crust in order given. While rooting around in my deep freezer the other day I found a bag of small packages of roasted tomatoes from last fall. I was very pleased as I thought they got all used up. 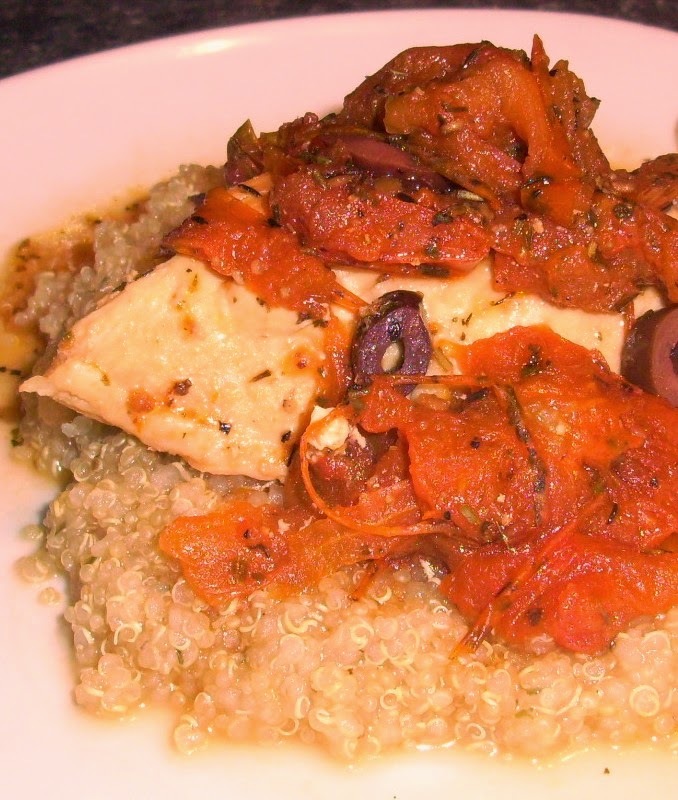 I thawed a bunch and created this Mediterranean inspired dish. If you don't have any on hand you can roast any type of small tomato in the oven quicker than I did previously...just turn the oven up to 375F and roast for about 30 minutes. They will be a little more moist but that is fine for this recipe. I chose quinoa for my starch here however, couscous, rice or a short pasta would work well here too. It really does pay off to tuck things away in the freezer to enjoy when certain vegetables or fruit are out of season. In a large deep skillet heat a bit of olive oil and brown the chicken. Remove to plate and set aside. Over medium high heat deglaze the pan with the red wine vinegar. Add remaining ingredients except quinoa and combine. Arrange the chicken breasts on top of the mixture in the pan. Bring to a low boil then reduce to a medium low. Cover and cook until chicken is cooked through and sauce is thickened a bit. Meanwhile cook quinoa or starch of choice according to package directions. I am Robyn Hall and I'm just a food nut who's creations are inspired by chefs such as ...Gordon Ramsey, Jamie Oliver, Giada de Laurentiis, Jessica Collins,Michael Smith and Nigella Lawson. ~Most recipes are basically just a guideline. Feel free to add more or less of an ingredient. ~I'm a "toss some in and taste it" kind of gal, so therefore, certain ingredient quantities such as seasonings, are estimated. 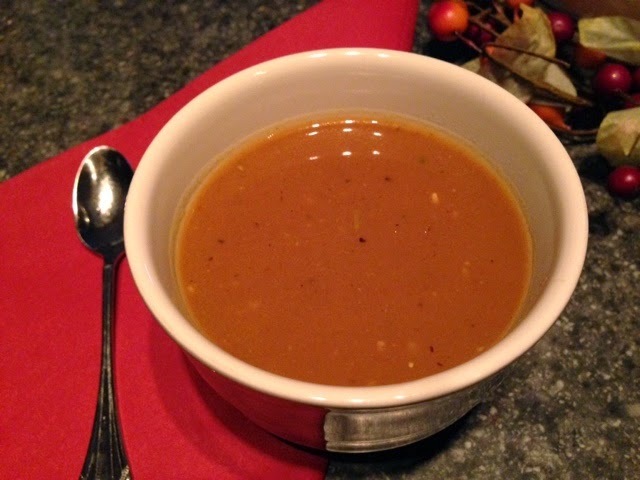 ~All recipes and photos published on Hall In The Kitchen are original creations or adaptations by me, unless credited to another, or cookbook. I have learned to cook by guidance and inspiration from cookbooks, family and celebrity chefs. Hall in the Kitchen. Powered by Blogger.